Chilling Bungalows with tranquil environment. 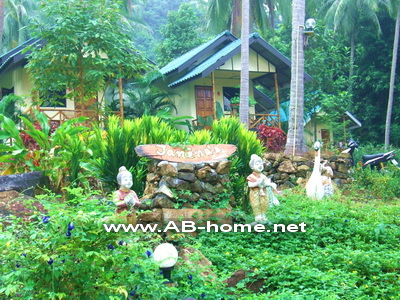 Little Eden Guest House in Lonely Beach is a peaceful place for backpacker on Ko Chang island. 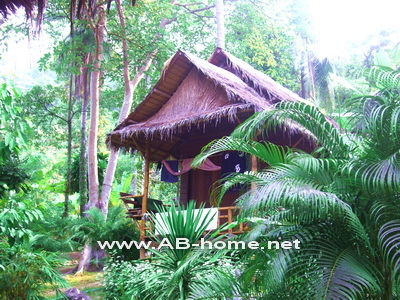 You will find the cheap Little Eden bungalows on the mountain site of Lonely Beach. The cozy huts of Little Eden are next to the restaurant which serves breakfast, Thai dishes and beverages for chilling evenings with other travelers. Little Eden Bungalows Koh Chang is not far from the center, this make it easy to go out for dining, grubbing and drinking. The friendly Thai owners and the live music make these bungalows to a perfect hostel for backpackers who like to relax and enjoy life on Koh Chang Paradise Island in the Gulf of Thailand. Little Eden Lonely Beach is one of the cheapest and best accommodations in this international village in Thailand. Cheap Bungalow Resort in Lonely Beach. 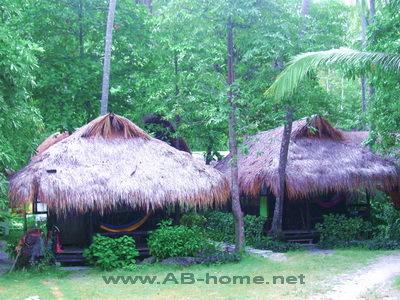 Janinas Resort in Lonely Beach has 8 bungalows with hot water shower and air condition or fan. The clean and cheap rooms attract backpackers and tourists on Koh Chang island who traveling on budget. Janina’s Koh Chang is on the mountain side with nice views to the jungle of Thailand. Janinas Guest House is a cheap, comfy and good choice if you like to stay near the center of Lonely Beach village on Ko Chang. 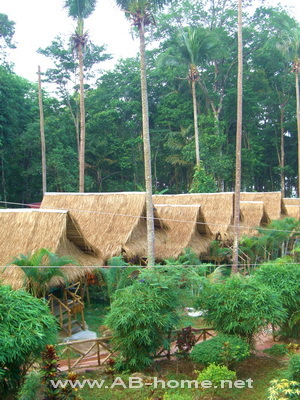 Janina’s Resort is a worth hostel for quiet traveling on Koh Chang paradise island. Simple and Cheap beach huts in Lonely Beach. Sunset Hut Guesthouse in Lonely Beach Koh Chang has beach front bungalows and a restaurant for a tranquil stay in Koh Chang’s backpacker village. 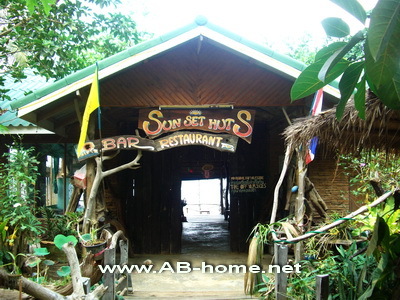 Sunset Huts is direct in central Lonely beach which allows nightlife tours and going out to the widespread massage salons, tattoo shops, restaurants and bars. Sunset Huts Koh Chang offers cheap accommodation and a friendly service on a beautiful piece of land in Thailand. The nice owners and the sea front location make this cozy traveler guest house to a popular meeting point for international traveler in Thailand. Take a look at Sunset Huts Lonely Beach and fall in love with this small hostel on Ko Chang. Magic bungalows in a mystic and tropical environment. Magic Garden is a popular bungalow park and nightlife location in Lonely Beach Koh Chang. The natural beauty and the nice beautiful bar area are unique in Lonely Beach. Backpackers love this peaceful place. Magic Garden Koh Chang offers as well a cinema screen and a good variety of tropical cocktails in a magic atmosphere in an exotic environment. This established accommodation is direct in the center of Ko Chang’s backpacker village Lonely Beach. The bamboo huts are next to the sea which is a good chance to swim in a tropical ocean with 30 degrees water temperature. Magic Garden Resort is a good choice for budget traveler and people who look for natural accommodation in a nice garden in east Thailand. Nature Beach Resort is on the sandy water stripe of Lonely Beach in Koh Chang. The wonderful bungalows and the nice Nature Bar attract many backpackers and travelers for nightlife and accommodation on the beach. 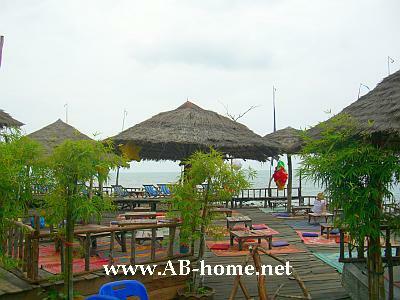 Nature Beach Koh Chang is one of the leading Guesthouses and bars in Lonely Beach. The simple bungalows are just 250 meter from the center of Lonely Beach. This nice spot in Thailand offers fantastic views to the ocean. At the bar of Nature are backpacker and full moon partys with fire shows and many open minded people from many parts of the world. The cheap prices and the natural beauty of this place makes Nature Beach to a fantastic Guesthouse for budget tours to Ko Chang in Thailand. 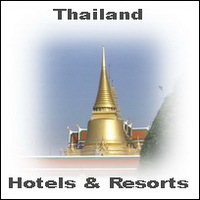 4 Star luxury Hotel on Ko Chang. 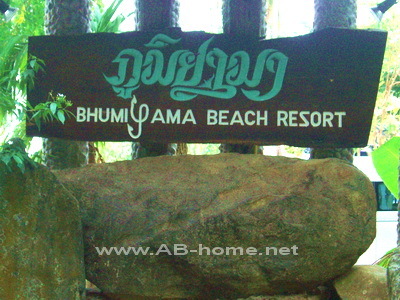 Bhumiyama Beach Resort is in Lonely Beach on Koh Chang. This 4 star luxury hotel offers deluxe accommodation with luxurious rooms and great food. Bhumiayma Koh Chang is also a popular honeymoon destination for a romantic stay with flair and style on a white beach in Thailand. The villas and deluxe suites are appointed with beauty decoration and all things what you need for honeymoon and luxurious Thailand beach holidays. The Bhumiyama Resort Koh Chang is not just for young couples a good choice. The restaurant and the friendly service at this boutique resort will be a unforgettable experience of tranquil atmosphere and exclusive Asia vacations. For hotel bookings and resort reservations follow this link. 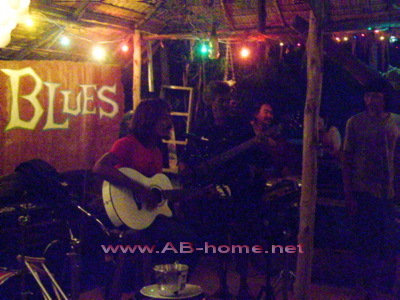 The Stone Free Bar at Lonely Beach is my favorite location for handmade live music on the tropical Island Koh Chang. Every week the Sticky Rice Blues Band and friends give a world class concert for Tourists and Backpackers. For many travelers is the evening here at Stone Free the highlight of their Thailand Travel Tour. The cheap prices for drinks like beer and longdrink buckets invite as well people who travel on a low budget. The small bar at the center of Lonely Beach offers every afternoon jam session for hobby musicians and Backpacker on the beautiful Island Ko Chang in Thailand. The Sticky Rice Blues Band play the best of Reggae, Rock n’ Roll, Classics and of course good Blues. The songs of Hendrix and Perkins are like made for Mark the guitar player and singer of the band. The staff of the Stone Free Bar on Chang Island in Thailand is very friendly and helpful. At the bar is a familiar atmosphere and the most customers come every evening back to listen to the live music at Lonely Beach in this great location. The hang mocks at the bar invite to hang around and chill to the good live music. The Stone Free Bar is the right destination for traveler, backpacker and all people who want to listen to handmade music. This Bar in Thailand is perfect to meet open minded people from around the world. Try it out and step into a world of blues, reggae and many many fun. 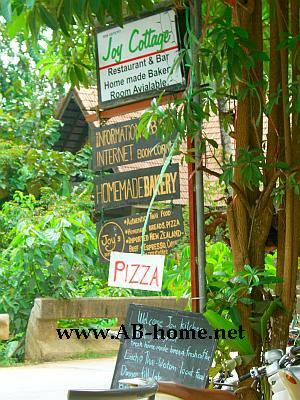 Joy Cottage Restaurant is located on the north end on the main road at Lonely Beach on Koh Chang. The Thai style Restaurant, Pub and Bar offer Draft Chang Beer, Homemade Pizza, fresh Bread and fresh Fruit Shakes in a nice atmosphere. At evening a solo artist play guitar and sing Blues, Rock n Roll and Reggae Live Songs and invite Tourists and Backpackers to Jam Sessions. 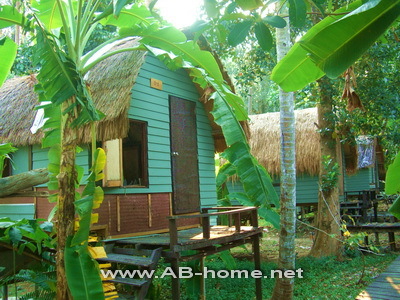 The Joy Cottage Guest House on Koh Chang in Thailand offer as well simple Backpacker Rooms for a good traveler price. At Daytime some traveler Chill, read a book or share tips to Travel Tours around Thailand and Southeast Asia. Joy Restaurant at Lonely Beach on Ko Chang is a good place for people from around the world who want to relax at holidays and meet travelers from many destinations and friendly locals from Thailand. This is a nice easy going Bar and Guest House on the Backpacker Village on Koh Chang in Thailand.